Sequins? YES. Maxi Skirt? YES PLEASE! Two of my favorite things at the moment all rolled into one? TO DIE FOR! I want this skirt RIGHT NOW. ON ME! PLEASE! This whole outfit is just lovely and goes back to my steal the look for less post from Wednesday with Jayma Mayes and her sequin skirt and button down top (you can read it here). This is so beautiful and so elegant and I love the shirt and the belt for this whole look. Okay so I got these in the mail last Friday and didn't do my post till Sunday but I still love them. I also didn't really get to wear them till Monday so technically this still fits in. You can read my whole Product Review on these boots here. This look is totally like J. Crew's Spring 2011. I did a post on how to steal her look for less on Wednesday (which you can read here) after I did this post I noticed that a lot of people are catching on to the sequin casual look. I saw this girl yesterday at the J. Crew Sample Sale on looking fantastic with a sequin mini skirt and a simple button down top. It's really great to see an outfit like this out on the streets on a normal person (someone who isn't a celebratity and doesn't have their own stylist). Okay so I went to American Apparel this week with the purpose of buying black leggings, which I did indeed end up buying, but I also tried on this skirt....Which now I'm in total love with. Of course it's a maxi skirt which in return means I love it. But I also love the sheerness to it and the elestic waist. I had talked myself OUT of buying this skirt. It's def. going on my Christmas list. I also want to take this time to thank Alena from C'est Freak, Le Chic. She had hosted a giveway back in the beginning of October which I had TOTALLY forgot I had entered...but I got a lovely email from her yesterday notifying me that I had won her contest!! What a great way to have had ended my Thursday! 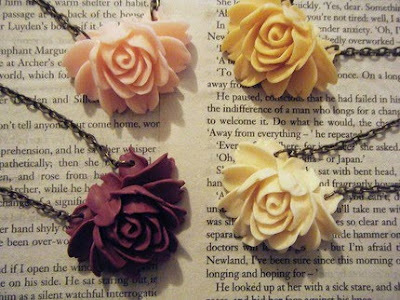 I won these really beautiful Rose Pendant necklace from an online jewellery boutique, Lottie Blyth. Aren't they just way to adorable! I never win anything! I'm so excited to recieve my beautiful necklace. Thank you again Alena! Go check out her blog NOW C'est Freak, Le Chic! Anything you guys really loved this week? HAPPY FRIDAY!!! Hope everyone has a great weekend! The J.Crew skirt is so dreamy! I am in love with sequin skirts right now. I love the sequin numbers that you picked, especially that floor length skirt. i love the sequin maxi, ah so great. i'm following, hope you can follow me back! I love both of the sequin skirts and the rose necklace, very cute! the first picture/look is so beautiful!